Two brothers, enrolled at the U.S. Naval Academy on the verge of the Korean War, fall in love with the same girl. A farm boy and his dog go hunting with his teenage brother (Fabian) and an older friend ( Stuart Whitman) in 1912. Lawyer defends migrant worker falsely accused of two murders. An American architect traveling in Madrid falls in love with his interpreter but is faced by a jealous lover who follows them. In the 1950s, Arizona Deputy Sheriff Les Martin is pressured by his community to solve a string of mysterious murders around a mining ghost town in the Grand Canyon. A scientist haunted by the incurable illness epilepsy meets a beautiful woman haunted by the voice of her dead husband. Social worker tries to befriend local slum gang. Two Brothers Loving the Same Girl...As Dangerous as a Runaway Jet! Boxing coach: [to Jim Scott and Tony Scott] Go cool off in the showers, both of you. Red, White, and Blue and Diana Lynn too! 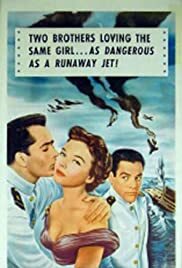 Very patriotic soap opera of the life of two close-knit naval cadet brothers (McCarthy and Derek) in love with the same woman (Diana Lynn, an absolute delight in a straight role). The stars charm, 50's period flavor (the only thing missing is a bottle of Coca-Cola), and classic story line carry the film. Enough interest for naval buffs and romance fans...and in glorious color! Good choice for a Red-White-and-Blue patriotic holiday.